Holi is synonymous with colours, water pichkaaris, revelry, bhaang and puranpolis and mithais. For some, however, Holi could mean allergic skin reactions, acne breakouts, dry, frizzy hair. If you love playing Holi but dread the havoc that’s wrecked by the synthetic Holi colours and dyes laced with toxic chemicals every year, you need to understand that with a little bit of care, you can celebrate Holi without all these worries about skincare problems. • Abhyanga: Abhyanga in Ayurveda means oil massages. “Oil creates a greasy protective layer on hair and skin. This layer acts as a barrier stopping colours from settling into follicles of hair and our skin. An oil-based layer helps the colour wash out easily post the celebrations. Choose from oils like coconut, olive, almond and others depending on your skin type. These oils not only protect but also nourish and hydrate your skin,” suggests Astha Katpitia, Head of the luxury beauty brand, Shankara. • Sun-protection cream: If you are playing Holi outdoors, you will suffer sun tanning, damage and sunburn. Out on a sunscreen that will ensure protection from harmful UVA rays. “Do not forget to protect your lips by applying a layer of Vaseline or petroleum jelly. Use a lip balm with an SPF too,” says Dr Sharmila Nayak, founder and medical director of The Skin 1st Clinic. • Hydrate: It is also important to hydrate yourself with enough water, fruit juices and fruits with high water content to avoid dehydration when you are out in the sun. Juices and fruits help keep you hydrated and gives your skin a healthy glow from the inside. 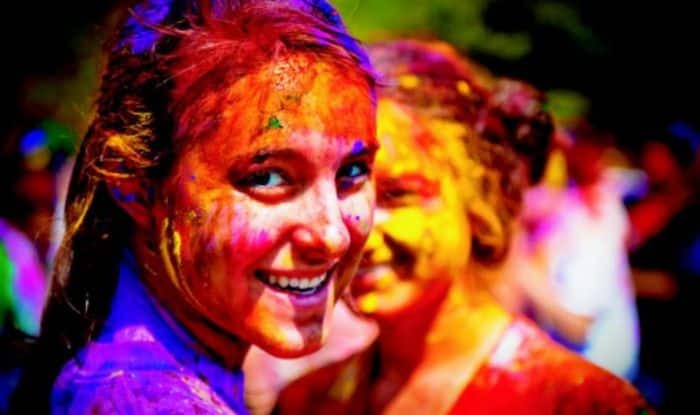 “Don’t bleach, wax, thread or do chemical peels before Holi as your skin could get more sensitive to the colours and the sun,” says Dr Sharmila Nayak. • Cleanse: “It is important to cleanse your hair and body thoroughly, ensuring you rid yourself of colours to avoid acne, rashes and allergies post the Holi celebrations. It is recommended to use a good cleansing cream or oil before a shower to take off the colour. A cleansing cream and oil works to effectively remove pigments and remnants of colour with minimum friction. Ensure washing off colour from hair and skin with a mild cleanser. You can use a natural toner with rose or cucumber extracts after a shower to minimize open pores and restore its sebum balance. Another effective product to use post your shower is glycerin. Natural glycerin is gentle on skin and helps soothe inflammation and redness. Use a natural hair serum concocted by mixing base and essential oils like lavender or bergamot to relax your hair strands and reduce frizz,” says Astha. • Mask: Use of homemade masks like Ubtans is good to nourish, balance and pamper your skin. Ubtans help reduce acne, remove blackheads and balance your skin’s Ph level. You can also opt for masks made with tomato juice that help reduce sun tan and burns or rose extracts to hydrate and make skin supple, according to Astha. • Moisturize: It is important you complete your skincare regime by applying an effective moisturizer that is best suited for your skin type which will not only hydrate but also nourish the upper layers of the skin making it soft and supple. You can also mix your moisturizer with a few drops of naturally extracted essential oils for a luxurious, lingering fragrance afterwards.